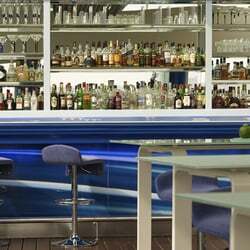 Guests at ‘Bleu Lounge’ can enjoy Bosphorus views alongside Mediterranean inspired snacks and innovative signature lab-cocktails in imaginative laboratory glasses. As night falls, stars, dazzling city lights and the glow of the floodlit Bosphorus Bridge, illuminate the view, creating an unforgettable ambience. Sophisticated smooth tunes fill the air, transforming Bleu Lounge while the glowing electro-blue bar becomes the center of attraction serving innovative cocktails in imaginative laboratory glasses.